Aughlisnafin seniors were defeated by six points away to Dromara last Friday evening. Despite very soft underfoot conditions both teams served up a decent game of football writes Geároid Ó Lionnacháin. 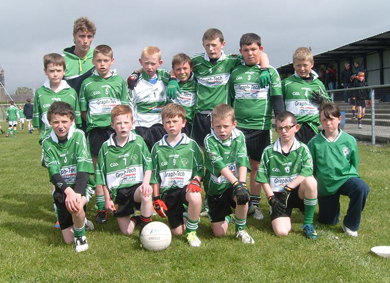 The U12s who reached the Shield Semi-Final at An Riocht. Dromara were three points ahead after twelve minutes while the Fin did not take their opportunities when they arose. James Brannigan literally dragged the Fin back into the game with two pointed frees after good work by Breannain McComiskey. It was McComiskey who then drew the Fin level sending over after taking a short free from Paul Flanagan. The Fin then had a chance to go in front. Chris Doran was impeded after racing through on goal but the Dromara keeper beat away McComiskey’s penalty for a ’45. In the next attack Brendan Quinn provided the assist from McComiskey to slot over his second point of the game. Dromara bought on Kieran Kelly and he helped swing the lead back to Dromara as they tagged on two points before the short whistle. Half time Dromara 0-5 Aughlisnafin 0-4. The first ten minutes of the second half was nip and tuck with the Fin and Dromara scoring two points apiece with James Brannigan getting both Fin scores. McComiskey then fired in a major when he soloed through and let fly a screamer which was helped into the net by Brendan Quinn. It will go down as McComiskey’s goal but Quinn’s presence in the small square was a big factor. Dromara responded with a point from Kelly who was becoming more influential as the game wore on. Points from Sean Fitzsimmons and Chris Doran give the Fin a three point lead by the end of the third quarter but Dromara won and converted a penalty and finished strongly to score a further 1-3 without reply. Final score Dromara 2-10 Aughlisnafin 1-8. James Brannigan was undoubtedly the Fin’s man of the match with an immense display in midfield with Brendan Quinn, Chris Doran and Breannain McComiskey all working hard throughout. Aughlisnafin team : M McClean, A Quinn, F Boden, Patrick Flanagan, S Fitzsimmons 0-1, N Duffy, N Travers, J Brannigan 0-4 (3 frees), B McComiskey 1-2, Paul Flanagan, P McClean, C Doran 0-1, B Quinn, S Willoughby, N Lennon Subs: S Hazard, C McCabe, M Malone, B McDonald, E McGlue, R Murphy. Next match is at home to Ballykinlar this Friday at 7.30 pm. Then away to Mitchels on Monday 10th June. The U-12’s attended the An Riocht Tournament and played three very tough games against Shamrocks, Kilmacud and Carryduff. They progressed to the Shield and defeated Fingallions, Dublin in the quarter finals. Four points from Shea Croskery, a goal from Rhys Clarke and a point from Conall King saw them edge a 1-5 to 1-2 win. This set up a semi final against eventual Shield winners Sarsfield who proved too strong for a young Fin squad. The U12’s will be back on league duty next Sunday at home to Carryduff at 11 am. The Fin ladies lost to away to St Michael’s on Saturday evening. Naomh Seosamh U-16’s are away to Newry to play Mitchels this Sunday at 4 pm. The U-14’s are at home to Kilclief on Monday evening at 7.30 pm. On Monday 10 June the U-14’s are away to Loughinisland. The U-10.5’s will attend Go Games hosted by St Johns this Saturday at 10.30 am. Well done to Down Senior & Minor Football teams in defeating their Derry counterparts in the Ulster Championship. Also well done to the Down Senior Hurlers on reaching the Christy Ring Final against Kerry after defeating Meath. Maire Scullion (9) is the 49 club winner. Lotto 3, 6, 12, 18. Pauline Kelly and Margaret Scullion both matched 3 numbers and share £50. Jackpot is now at £5,000.